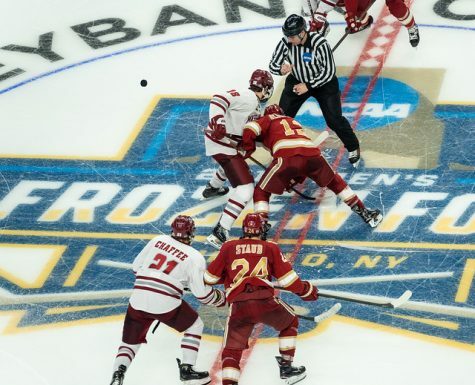 The Massachusetts hockey team hopes to end its three-game losing streak Tuesday against a familiar foe in an unfamiliar situation. 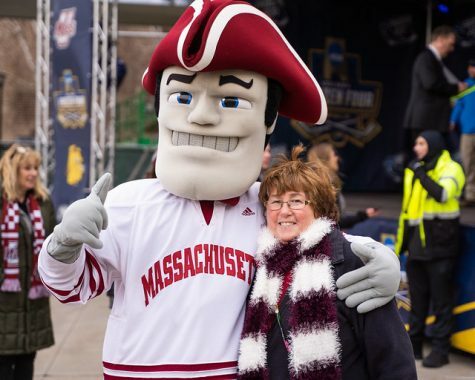 The Minutemen will face Northeastern, a Hockey East opponent, in a nonconference game. 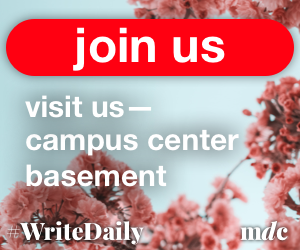 It’s a scheduling quirk — their only game between Dec. 6 and Dec. 28 — and a chance to face a Huskies squad that UMass topped once before this season. 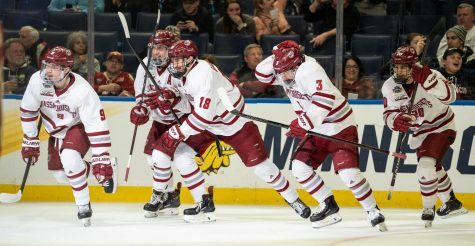 In the first meeting on Oct. 24, UMass (4-11-0, 1-9-0 Hockey East) escaped with a 3-2 victory behind an Emerson Auvenshine goal with under nine minutes left in regulation. The loss came amid a nine-game winless streak to open the season for the Huskies. However, as winners of four of their last six games, Northeastern (4-10-1, 3-6-1 Hockey East) heads into Tuesday’s matchup posing a different threat than in October, according to senior captain Troy Power. The Huskies’ recent hot streak includes victories over then No. 3 Minnesota on Nov. 29 and most recently No. 16 Providence on Dec. 6. 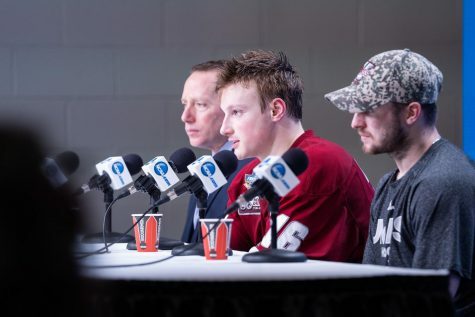 Minutemen coach John Micheletto said that the improved play of redshirt senior goaltender Clay Witt has been the difference for Northeastern. Witt is coming off a 37-save performance in the Huskies’ 2-1 win over the Friars. Micheletto said that offensive play down low in front of Witt will be important in trying to beat the netminder on rebound opportunities and pointblank shots. Power added that playing sound defense will contribute to creating more scoring chances. He particularly noted the importance of creating turnovers and winning battles for loose pucks to create man advantages on offense. These defensive results were not consistent for UMass in the Oct. 24 matchup. The Minutemen were outshot 44-28 and allowed numerous Huskies’ chances on transition. Freshman Henry Dill made a career-high 42 saves in net to preserve the victory for the Minutemen. However, Power said that the defense can not commit similar mistakes Tuesday. 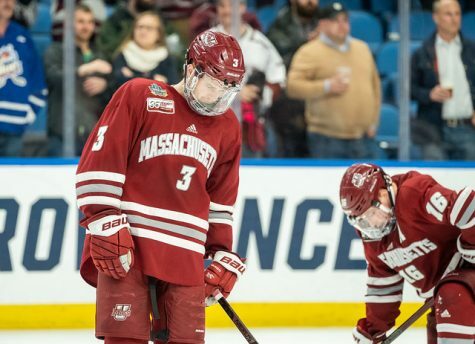 UMass enters the week on an opposite trend to Northeastern as losers of six of its last seven games and in last place in the Hockey East. 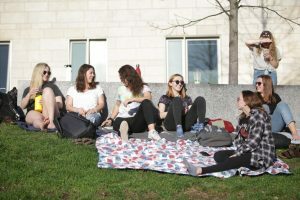 But with 10 days in between games due to finals week, Power said the frustrations that appeared in last weekend’s winless set against Notre Dame are behind the Minutemen. 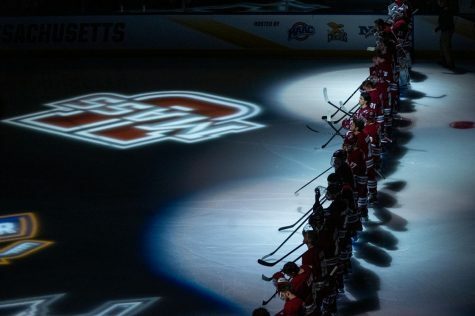 Tuesday’s puck drop at the Mullins Center will be at 7 p.m.
Micheletto said that the status of Ray Pigozzi for Tuesday’s game is still unclear due to an upper-body injury that has kept him out of the lineup for UMass’ past two games. The sophomore is tied for the team lead with 12 points and was a key contributor on the Minutemen’s most productive line alongside Frank Vatrano and Steven Iacobellis. 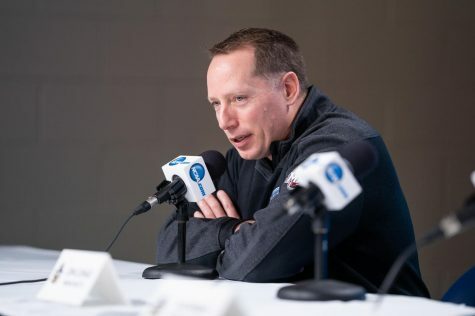 One new addition to the Minutemen’s lineup will be freshman Brandon Montour, who will make his debut Tuesday after returning from a period of ineligibility to start 2014. 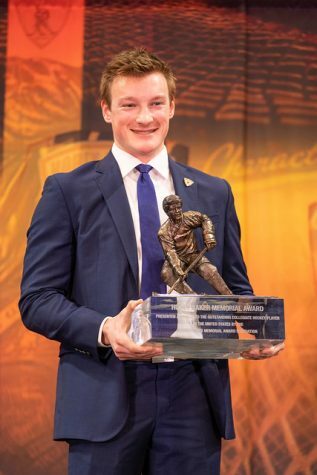 The 6-foot, 190 pound defenseman was selected in the second round of the 2014 NHL Entry Draft by the Anaheim Ducks. While he was ineligible at UMass, Montour played for the Waterloo Black Hawks of the USHL, where he recorded 21 points in 17 games. According to Micheletto, Montour has practiced only twice with the team, leading the coach to temper his enthusiasm for now. But Micheletto said that he is excited for what the freshman can eventually bring to the Minutemen’s backline.